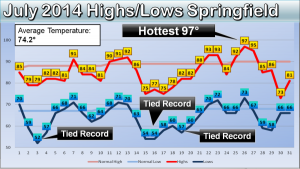 July 2014 contained a lot of cool days with records broken or tied a few times. This contributed to putting Springfield in the top ten coolest July rankings. 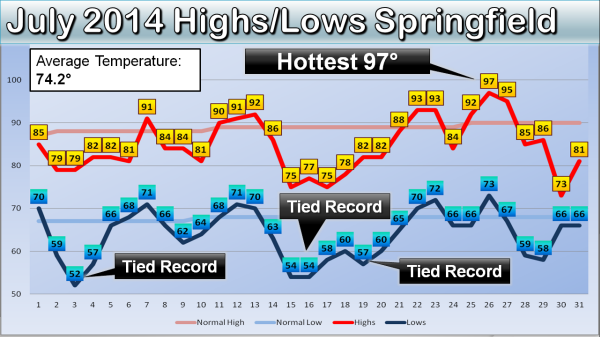 The average temperature in Springfield for July 2014 was 74.2° which is the 9th coolest in the books. Records have been kept for 127 years. The lowest temperature was 52° on the 3rd which tied a record low. Record lows were also tied on the 16th and the19th. West Plains had their coolest July on record with records only going back 67 years. Joplin tied their all time record low for the month when they fell to 50° on the 16th.